Pet food recalls often make headlines, but there is one danger surrounding the feeding of pets that does not often make the news. They are common in every home, but they pose a deadly threat to pets. In fact, several beloved family pets have died in just the past few days because of them. What killed them? Regardless of what kind of food is inside, pet food bags, snack bags, cereal bags and other food containers can be a potentially deadly danger for pets. Most dogs and cats perk up at the sound of a bag of food, whether it contains kibble, pet treats, cookies, chips or other goodies they’d like to get their paws on. Curious cats and nosy dogs have unfortunately lost their lives trying to steal a taste of their favorite foods, though. The cat or dog sticks their head inside a food bag and just the simple act of their breathing can seal it around their face and neck in such a way that the pet will be unable to get their head out. They often panic and frantically run and thrash around the room as they try to break free. In a matter of minutes, they can collapse and suffocate to death, even when the owner is just in the next room. Though any bag can potentially be hazardous, the most deadly types are soft, collapsible bags, such as those made out of or lined with plastic or Mylar-like materials. 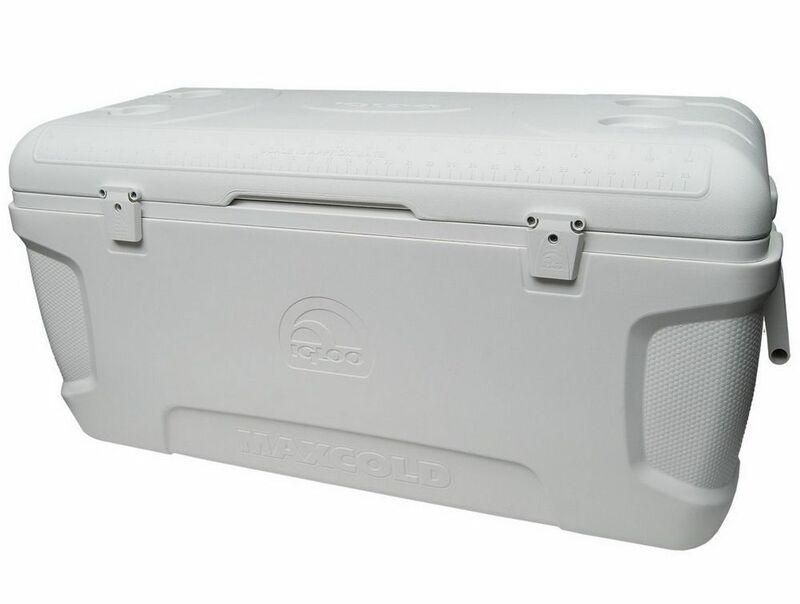 They’re especially dangerous if they’ve contained salty, sugary or fatty snacks and foods. It’s not just bags, though. Containers with narrow openings have also caused suffocation, including yogurt containers, Pringles tubes and even some pet treat containers. In fact, Sunshine Mills changed the shape of the containers for Pup Corn following the death of at least one hungry dog who lost his life after his head got stuck in the treat jar. This can happen to pets of any size, large or small, cats or dogs and even ferrets or rabbits. All it takes is the right sized bag to be within a pet's reach at the wrong time. Snack bags can be stolen from the counter or pulled out of the garbage. An inattentive teen could leave a bag of chips by the couch or a child could leave a bag of cereal on the table. A bag discarded by a stranger could blow into the backyard. Knowing about the danger is only the first step. Though not all risks can be eliminated, some precautions can be taken to significantly reduce the chances of a pet suffocating on a food bag. Trupanion veterinarian Dr. Petryk provided the below list of common ways your dog may suffocate, so you can avoid a tragedy, yourself. This is exactly what happened to Blue, the dog mentioned above. 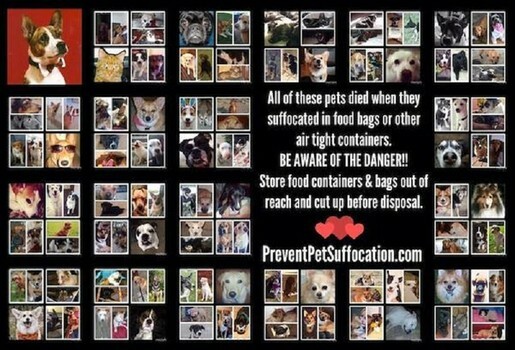 Prevent Pet Suffocation has a petition started to get food companies to put warnings on their bags. To sign it, click here. Something your dog probably has on him 80 – 100% of the time–his own collar–can be a killer. If your dog is microchipped and you are fairly certain they will not bolt out the door, it’s best to have them be “naked” in the house, especially if you are not there to watch them. Like chip bags, these can also be a cause for suffocation, according to Dr. Petryk. >Store chip bags, cereal bags, pet food bags and other food containers away from the pet’s reach. Tear up or cut holes into all chip bags and food bags after use, before throwing them away in the garbage. >Keep trash can lids tightly fastened or locked, or store the garbage can inside a cabinet. Make sure kitchen pantry doors are always closed. >If possible, don’t allow pets to roam freely in the kitchen while everyone is away. Tell both adults and children in the household why they should be vigilant about keeping food bags away from pets. >Take extra care around holidays, birthday parties, graduations, summer BBQs, and other times when groups of people gather at a home. >Learn how to perform CPR for pets in the event an accident happens. One of the most important steps to take, though, is to tell other pet owners about this hidden danger. Many people have learned to cut up six-pack rings and some have heard about crushing Yoplait containers to save wildlife, but the word isn’t out yet about tearing up bags to save pets. There are websites that have been drumming up awareness, though, including Prevent Pet Suffocation and Preventive Vet. Remove the bag from the animal's head. Feel for a pulse and watch for breathing. Once the animal has been revived or if CPR efforts are not successful after 10 minutes, bring the pet for immediate veterinary attention. All pets that have suffered a lack of oxygen, of any period of time, should be brought immediately for veterinary evaluation. Prevent Pet Suffocation has a Facebook page filled with sad stories of pet owners who learned of the danger too late. 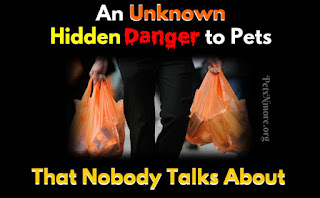 Sadly, a new story of a lost pet seems to be shared every few days; one statistic from PreventiveVet indicates two to three pets lose their lives each week to bag suffocation. 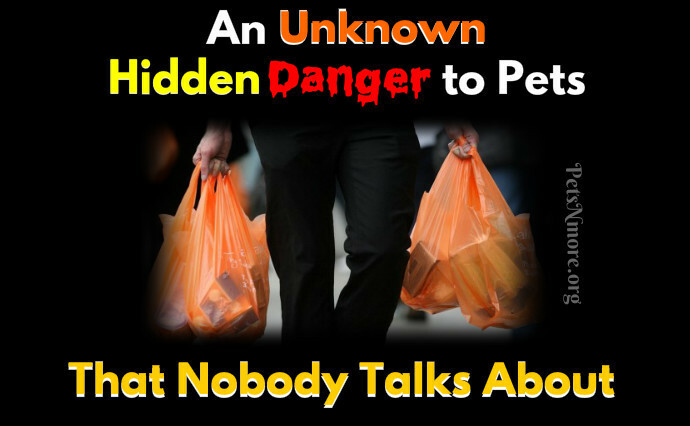 Many plastic bags warn that they could be hazards to children, but they should also warn of the hazards to pets. In fact, a petition has been started to put such safety labels on snack bags. Keep pets safe from by placing food containers out of reach and cutting bags or crushing packaging before tossing them into the garbage. Then spread the word to help other pet owners prevent food bag suffocation tragedies. 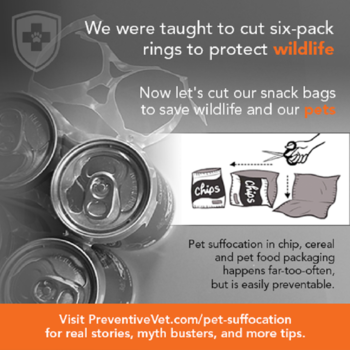 Together we can (and should) prevent pet suffocation! Thank you for reading and sharing this post.